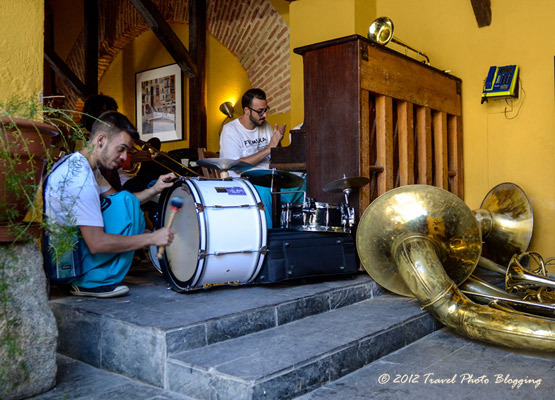 Every year La Granja de San Ildefonso is one of FEMUKA street jazz festival venues. Upon arrival to La Granja all the musicians lined up and played a tune or two while marching towards the center of the town. The first part of the concert took place in the shade of a small park. A group of locals was joined by a random group of tourists and everyone listened with smiles on their faces. 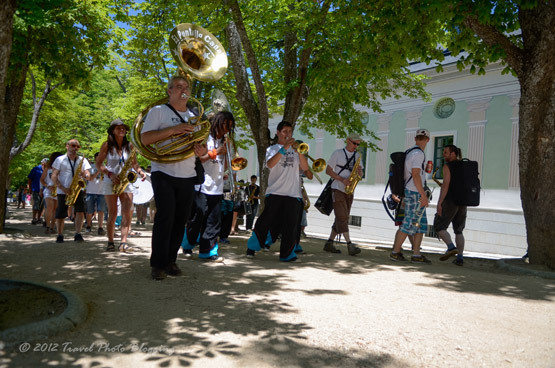 Almost every other street was also filled with music when bands marched past. Even a stop at a random resulted in a spontaneous jam session. It was a great feeling to just tag along and enjoy the almost non-stop musical experience. 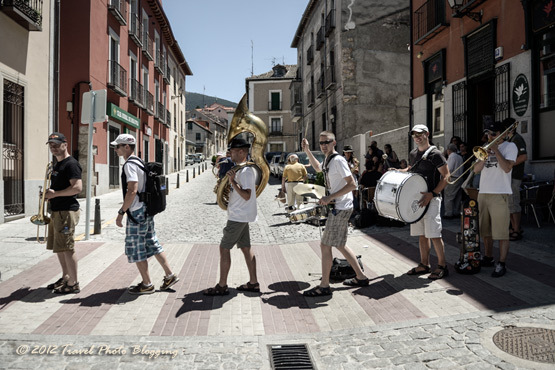 With or without music, this tiny old Spanish town, situated just 75 kilometers from Madrid is well worth a visit. 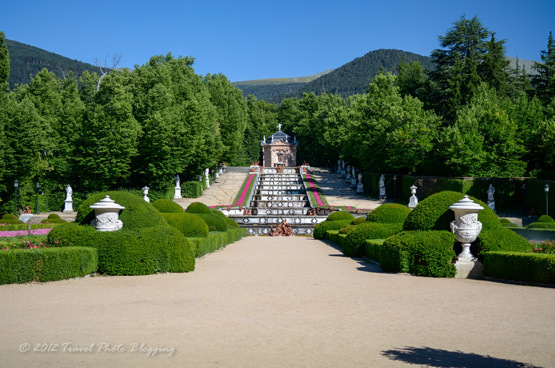 It is famous for a royal palace (Palacio Real de La Granja) built during the reign of Philip V and was used as a summer residence of the Kings of Spain for quite a while. It is quite obvious the palace itself and its vast gardens (covering more then 6 square kilometers!) were heavily influenced by Versailles. The royal palace houses an interesting museum with luxuriously decorated rooms. A part of the museum is dedicated to the Tapestry Museum. Highlights of the Tapestry Museum include the Flemish Apocalypse series, The Triumphs of Petrarch and the Honours and Virtues series, based on cartoons by Goya. These cover a huge section of walls and the details are absolutely amazing. I was lucky enough to enjoy the company of a person heavily involved in putting together of brochures about those tapestries. Unfortunately in our very limited time there, we could only scratch the surface of the story behind those stunning pieces of art. Also photography is not allowed within the museum, so to get an idea of how those tapestries look like, you will have to look elsewhere. If you are reading this - thanks again Brian for being a great host and guide. I hope there will be another chance for a proper tour of the palace together with its beautiful gardens. The whole place definitely deserves it. If such palaces are not your thing, there are also other reasons for visiting this cute little walled town. Every year many known musicians choose to stop at this place for a concert. In the past artists like Björk, Michael Bolton, Kar Češ Brass Band and José Carreras have already performed at La Granja de San Ildefonso. If you are planning a visit to the area it is always worth checking if there is something going on at the moment. It is hard to describe how special this little Spanish town really is. Maybe Brian mentioned above said it best: "I came here from Ireland with my wife to teach English for a year. Now, twenty-and-some years later, we can't imagine living anywhere else." Nice post! Thanks for sharing! Thank you for sharing excellent informations.